Police are hunting for a stolen car after a it rammed a police car in Chipping. Police launched a hunt for a stolen car after it rammed a police car in Chipping. The incident happened after a black Mitsubishi ASX was pulled over for a routine stop on Collins Hill Lane at around 3.20am this morning, say police. The Mitsubishi then "reversed into the police car and took off at speed." 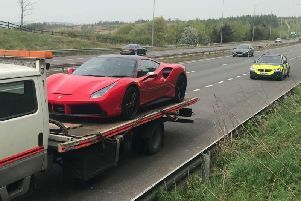 The Force Incident Manager for Lancashire Police said: "A car was stopped as part of a routine stop check in the early hours of this morning. The car then proceeded to reverse into the police car causing slight damage and accelerated away. "After making enquiries it became clear that the car had been stolen from the driveway of a property in Lower Lane in Freckleton." The car was later found abandoned in Bowgreave near Garstang after its driver managed to get away, a spokesman said.